One of the things my husband will tell you I ask him is whether he’s had anything green during the day. He’s fairly patient with this interrogation because he’s intelligent and knows that ultimately, regardless of what he eats, there have to be vegetables in his diet– especially brightly colored vegetables. But sometimes, green is enough, and often easier because all it takes to incorporate it into a day’s worth of meals is to have a salad. A big salad. I know many think salad is a warm weather dish, but to me, it’s one of the easiest ways to make sure vegetables are on the plate. Fresh vegetables. Nothing fancy — just a mix of what sounds good, what’s in the fridge, or what’s in season. And? The salad needs to take up half the plate. I grew up eating salads made exclusively with iceberg lettuce. I’m sure many of us did, and from what we now know, it’s because that’s what was in the market. Zero choice. 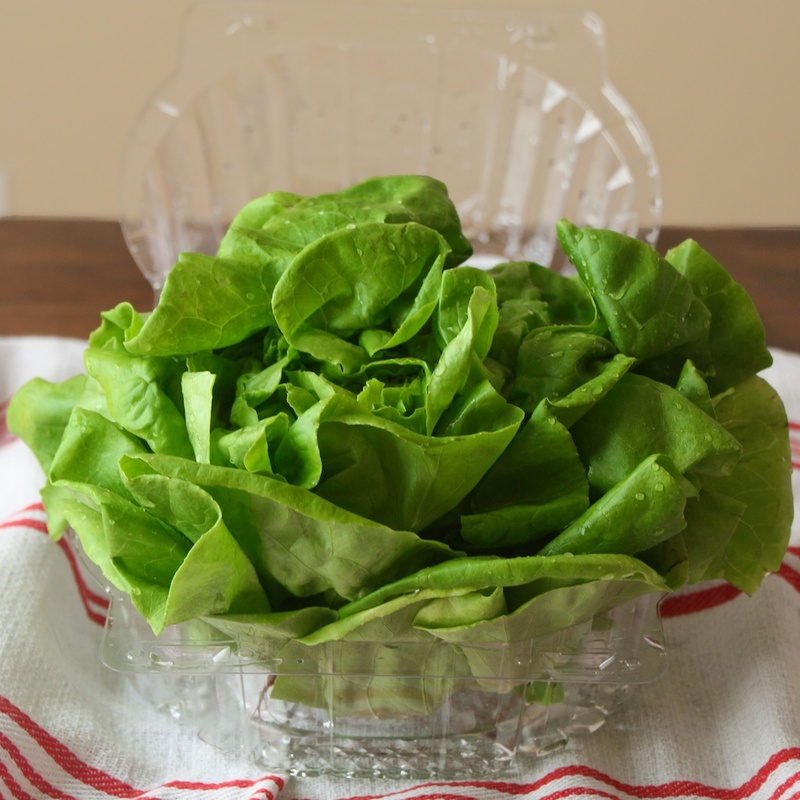 But one of the first types of lettuce I discovered when I was freshly moved out of my mother’s house was Boston Butter Lettuce. It was beautiful, delicate, and something I’d never seen before. Although I originally saw it in small heads placed in rows upside down in the produce rack, more and more, the heads I’ve become accustomed to seeing are larger. Much larger, and sealed safely inside plastic containers to keep them from being bruised. I felt decadent the first time I bought a head of butter lettuce, enjoying the tender leaves with all kinds of tasty salad ingredients, and thinking that yes, it tasted a bit on the buttery side. During our short trip to Laguna Beach this past summer, we had a late lunch on the balcony overlooking the beach at The Beach House. Although we both agreed the food was wonderful, I especially enjoyed the completely green salad made of a whole head of butter lettuce and all other green ingredients tucked under the leaves. Avocado, green striped tomatoes, green onions — wonderful. 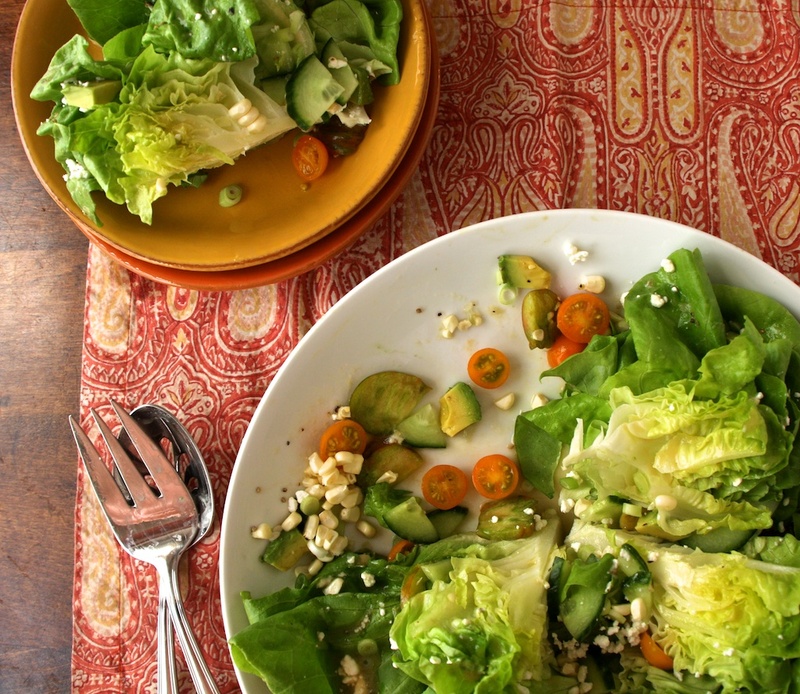 When I saw the “Boston Lettuce Salad with Herbs” in the September issue of Food & Wine, I decided to make a similar version of a delicious Boston Butter Lettuce Salad. Perfect for dinner, a special occasion, or just lunch all by yourself. Check off your greens for the day! 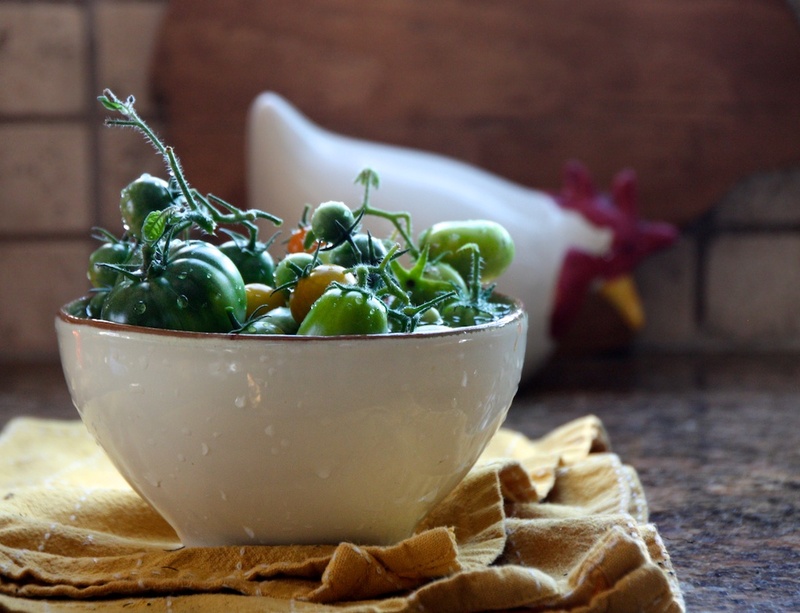 Lightly toss all of the dressing ingredients in a small bowl or combine in a jar to shake. 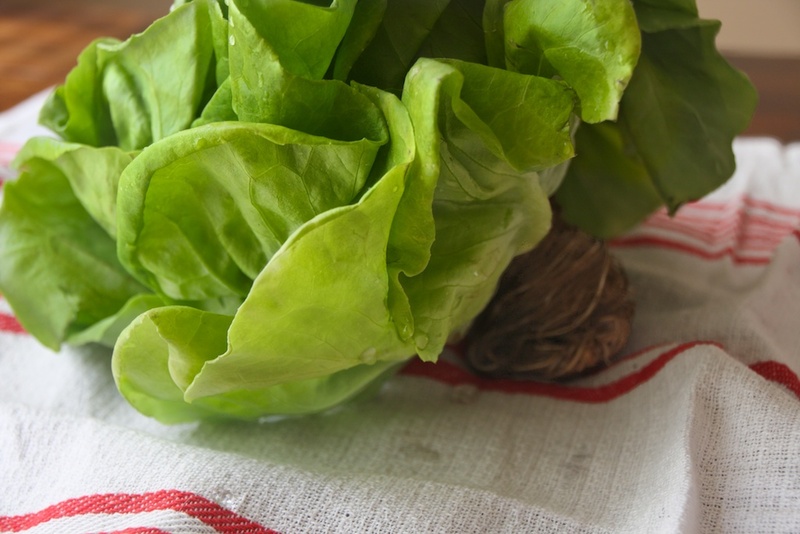 Arrange the head of butter lettuce in a shallow bowl, trimming away any roots or dried stem. Tuck the other ingredients between and under the leaves, or if you’d prefer, pour them over the head of butter lettuce as you prepare them. Drizzle the dressing over the head of butter lettuce. 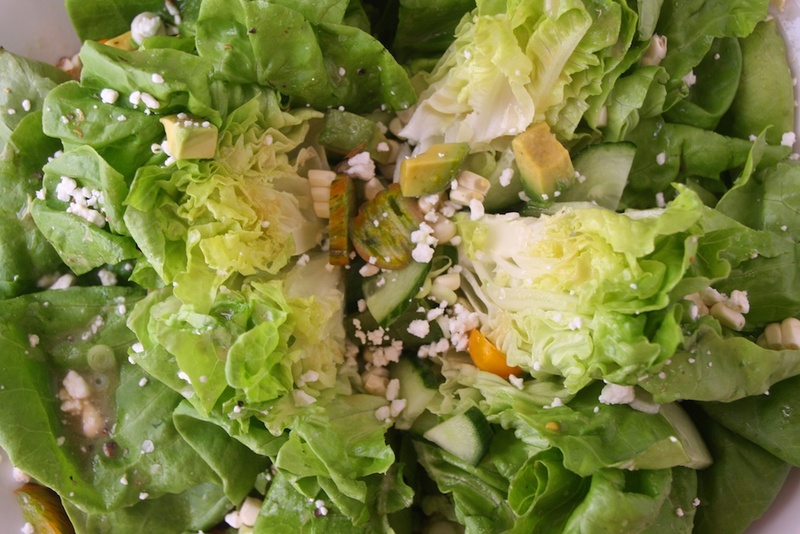 Cut through the head of lettuce if sharing — in half for two, or quarters for four. Pour any additional bits and pieces of ingredients into the split head of butter lettuce before serving. Don’t forget to sprinkle on the goat cheese. 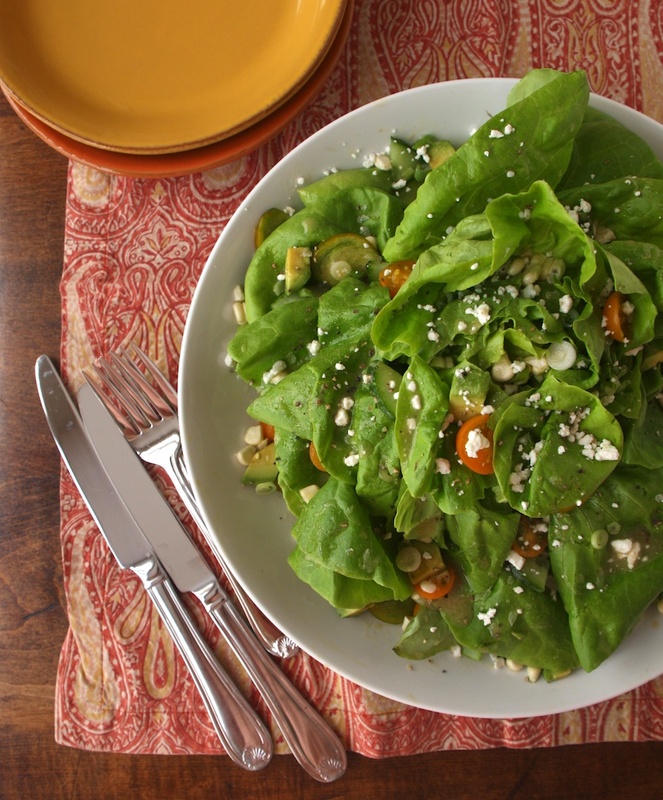 The recipe for “Boston Lettuce Salad with Herbs” at Food & Wine can be found here. 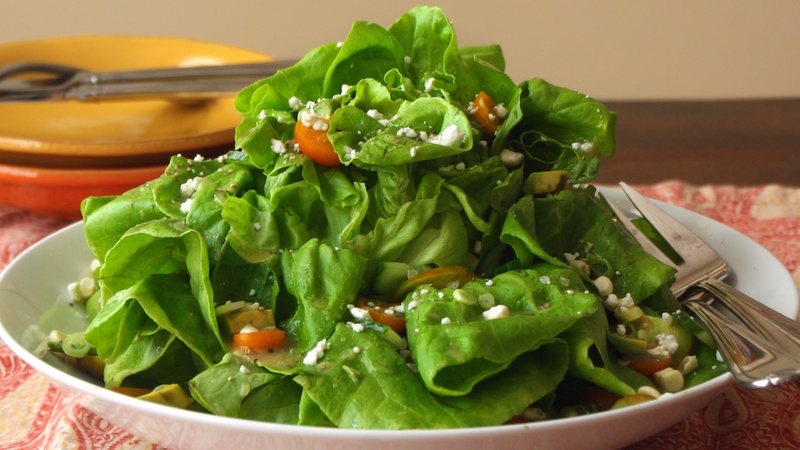 This type of salad green is called a variety of names, such as butter lettuce, Boston Bibb, bibb or it seems any combination of those. It’s still a velvety, tender salad green. I purchased hydroponic butter lettuce grown in the container I bought it in, roots and all. Interesting. To keep it fresh, it’s easy to layer lightly between damp paper towels. Or, if you’ve prepared a salad and want to keep it chilled, dampen a paper towel and lay it over the top of the salad before putting it in the fridge. 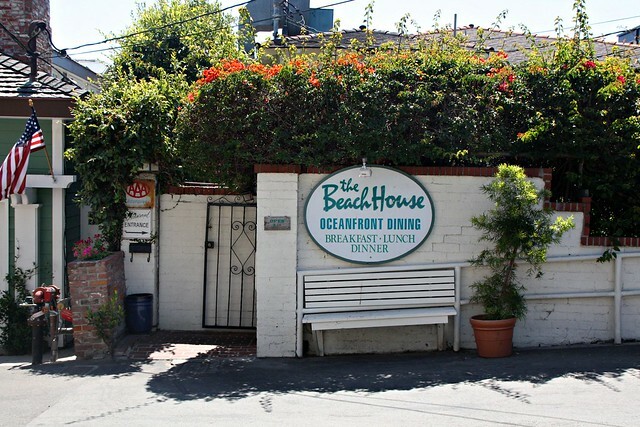 I don’t remember exactly what the salad at The Beach House had in it, but avocado and green striped tomatoes were a definite. I just loved the presentation. It kept me busy! I used a handful of the last of my tomatoes from my meager summer pot this year — they were perfect since they were seriously green. Thinking fried green tomatoes would have been excellent in this mix — with bacon bits. Sorry! Can’t help myself. I have never liked the flavor of tarragon. I think it reminds me a bit of licorice, and I don’t like licorice. But I keep trying to understand the flavor. It’s nice in this, but I’m a cilantro kind of person, so that would have been amazing. Have some fun with this. I know I always say that, but think of it. It’s not hard to make, so why not switch it up a bit to add a variety of ingredients or a different dressing. Mmm…butter lettuce. Have you tried it recently? There are all kinds of things to use it for — like lettuce wraps.